Stay fresh and deodorised naturally without chemicals, parabens, alcohol or fragrances. Work with your body, not against it, using this classic natural, effective stick deodorant. It’s simple but powerful formula works without blocking the skin's pores or leaving white marks on your clothes. Learn the secret of using natural crystal deodorant and you'll never look back. This deodorant is very economical and can last for many months with proper care. Unscented and unisex, it offers 24-hour protection. Not tested on animals and free from alcohol, aluminium chlorohydrate, parabens, fragrance and propellants. Apply to damp skin after washing. To use on dry skin, wet first then apply. Do not apply to broken or damaged skin. If irritation occurs, please stop use. This product contains salt and may mark some household surfaces. Avoid eyes. Not to be taken internally. 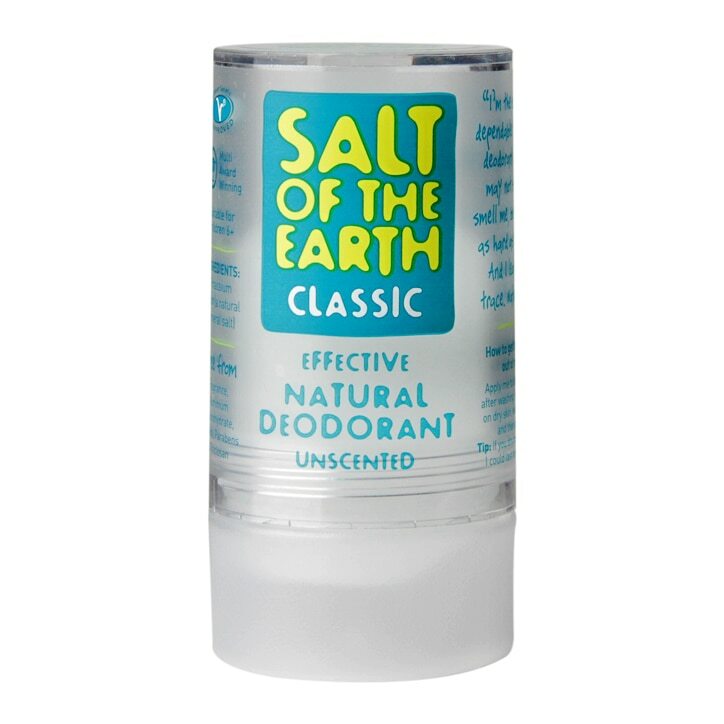 Salt of the Earth Natural Unscented Stick Deodorant is rated 4.2 out of 5 by 69. Rated 5 out of 5 by Anonymous from Effective Natural Deodorant (Unscented) It does exactly what it says. And more importantly, it doesn't do what it doesn't say, like cause Alzheimers and dementia with its nasty aluminium chlorohydrate. Rated 1 out of 5 by RJ103 from Didn't work for me I bought this 4 days ago and it doesn't work for me. It makes me sweat, I literally can feel it coming out of my pores in my arm pits, the sweat then dries on my clothes in that area which produces an odour. Interestingly enough my armpit doesn't. Maybe my body is adjusting to it. I'll use it for another 3 days (making it a week) if still not happy will revert back to Aloe Vera Forever Living deodorant. Purchased on recommendation. Not all products suit all. It's inexpensive to try (cost of a coffee and perhaps a cake) so no big loss although the feeling of worrying if I smell is far greater.